i just spent an hour and a half to layout a book (for a gift) in iphoto. 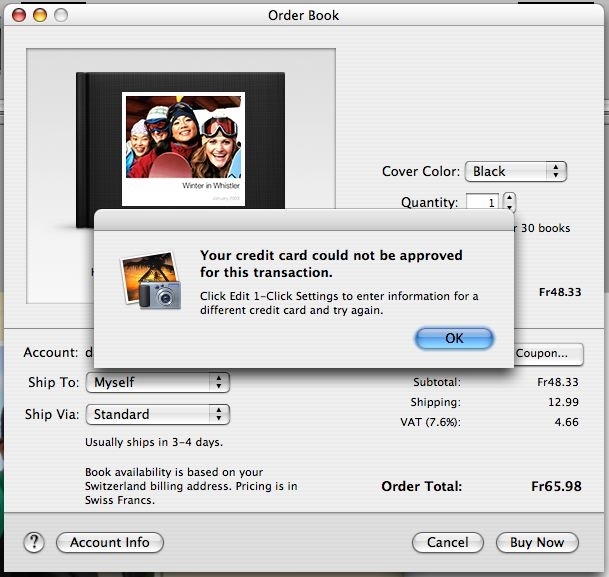 now, that i want to buy it, you inform me, that my credit-card cannot be accepted for this transaction. i double-checked with my credit-card-company, and yes, my card is fully valid and within its limit, so there’s nothing wrong with that. and i’d also love to buy sunny days, but that also doesn’t work. and hey, it’s a gift which i need soon, so what can i do?